Instructions: Click here for a larger photo of this project. Cut a piece of Poster Board 4 1/2 x 8 1/2" and top that with a piece of the Floral Fashionista paper. Use the Dies from the Eyelet Diamond and Diamond Basics, cut the bottom one out of Burgundy card stock and the top out of white. Adhere together, place Foam dots on the back and adhere to the center of the tag. Do the same with the Eyelet Heart, stamp the sentiment on the white add foam dots to the back and adhere to the center of the Diamond you just placed. 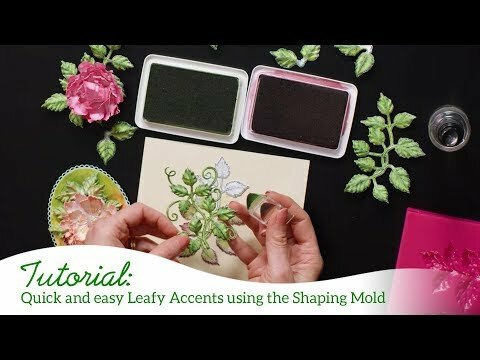 Stamp the 3 of the leaves on white cardstock with the Emerald Green, color in with the Vivid Chartreuse, use the coordinating die and cut out, ink the edges with the Leaf Green, place in the leaf mold and run through your die cutting machine, adhere to the top and bottom of the tag as shown. Save the extra one to add around the flowers later. Stamp the Oakberry Lane flowers (medium and small) on some of the Floral Fashionista paper with the Vibrant Fuchsia ink. 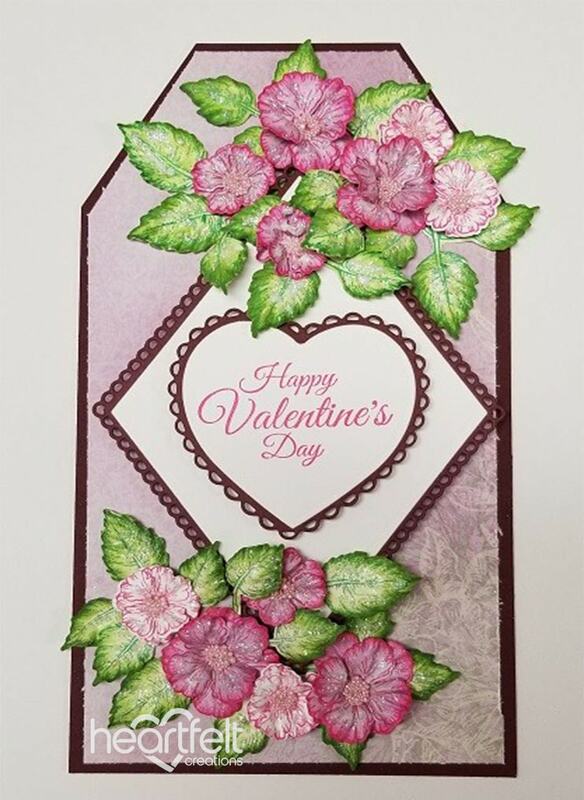 Cut out with the matching die, ink the edges with the same ink, stamp the small flowers on white cardstock with the Vibrant Fuchsia ink, cut out, place in the flower mold and run through the die cut machine, glue 2 of each size together, use the Deluxe Flower Shaping tool and press down in the center. Arrange the flowers around the leaves. Use the extra leaves and add where you think it's needed. To finish, add glitter to all the leaves and flowers and Prills to the center of each flower.